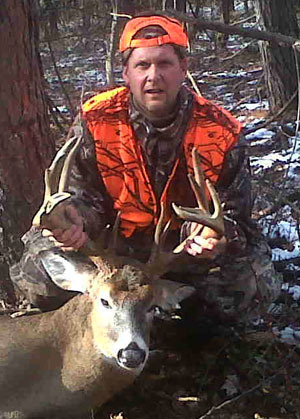 Took this big fella opening day of NYS shotgun season in the Cattaraugus County on 11/19/2011. 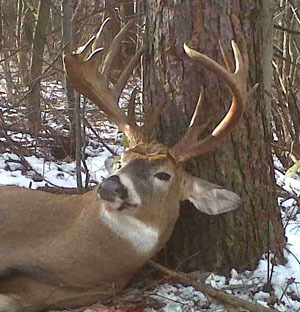 This was the same stand I took a 148 B&C, 9-point two years ago - thought I would never shoot a buck bigger than that. In any event, at about 8:15 a.m. I heard a car horn on a private dirt road adjacent to the property I hunt on (There is a camp there, but the people there do not hunt). When I heard the horn I naturally looked in that direction and in a matter of about a minute three deer came running out from that way. Two does cut across in front of me into some hemlocks and the third deer cut off to my right and headed up to a field behind me. I paid particular attention to this deer as I thought it might have been a buck. I am standing in my stand looking behind me,over my right shoulder, trying to see what I could make out... thinking the entire time that these deer had been spooked. Well, it was not the car horn that spooked these deer. I no sooner lost sight of the deer behind me and looked in front of me and here this buck came...charging after the two does in front of me. I knew right away he was a good buck and swung around to find an opening before he got to the hemlocks. As luck would have it, he came into my scope and a fired. The buck flinched and kept going into the hemlocks and as I watched him (I could not get off another shot) I saw him stumble, but thought he had just slipped in the snow. I tried to find him in my scope but saw nothing. Boy was I dejected..cursing myself for not paying more attention. So, I got down and figured I would see if I at least nicked him. I went to the spot where I thought I had shot and found nothing. I took about ten more steps into the hemlocks and suddenly found blood...lots of blood!!! I looked twenty more feet into thehemlocks and there he lay..done! I shot him right through the heart!!! Trust me when I tell you that I went from dejection to elation in about a second. Not only that I had NO idea he was that big a 16-point non-typical. Palmated on both main beams. He has two split brow tines and an extra kicker brow tine! Can not wait to get him scored!!! !